Considering a fiberglass or vinyl liner pool? We’re here to help. Even though we specialize in fiberglass pools, our goal is for you to walk away satisfied, and part of how we achieve that is by providing information on all types of pools, not just the ones we sell. Is a fiberglass or vinyl liner pool better for me? Vinyl liner pools typically cost about $10,000 less than fiberglass pools upfront. However, they need the liner replaced every 5–9 years and tend to look cheap. Fiberglass pools are much more durable, need less maintenance, and look classy. Fiberglass pools typically run up to 16 feet wide, 40 feet long, and 8.5 feet deep. While you can choose a wide variety of designs, you are limited to the predesigned molds. Even outside of the size restrictions, you can customize your pool to any aesthetic with water features, tiles, bench seats, therapy jets, tanning shelves, and colorful lights. Most vinyl liner pools are rectangular, but you can definitely customize the shape, size, and depth of the pool. Specialty shapes cost more, but still typically less than a similar fiberglass or concrete pool. We manufacture the fiberglass pool shell off-site and bring it to you. By the end of day 2, your pool is ready for swimming! The patio and decking need another week or two. From beginning to end, the process usually takes 3–5 weeks. The full construction process takes place in your backyard. Your vinyl liner pool will be ready to use in 4–8 weeks. DIY-ing a fiberglass pool can cost between $12,000–$30,000, depending on the pool size and any upgrades. Most fiberglass pool projects cover both manufacturing and installation, which costs $45,000–$85,000 altogether. As usual, you’ll pay more for extensive landscaping, accessories, and water features. Long-term, your only serious maintenance expenses will be in chemicals and electricity. You’ll spend almost $4,000 over a ten-year period. 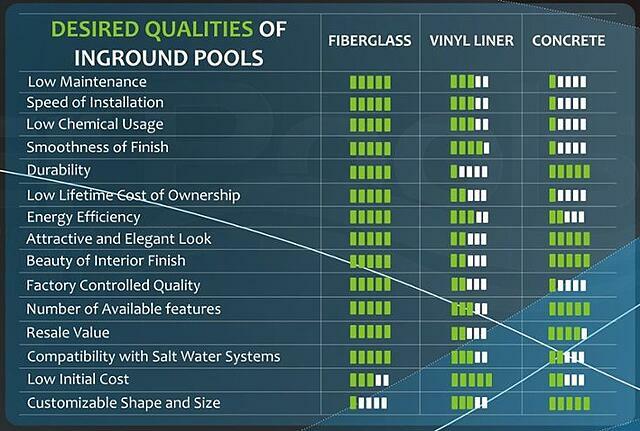 Most vinyl liner pools cost at least $10,000 less than similar fiberglass or concrete pools. If you love to DIY home improvement, a vinyl liner may be your Everest. Someone who wants a completely DIY vinyl liner pool may spend under $20,000. Base vinyl liner packages from most pool builders typically cost $25,000–$35,000, while ready-to-use vinyl liner packages will typically cost $35,000–$55,000. The pool will also use less electricity and fewer chemicals overall than a concrete pool of the same size, which reduces the lifetime cost. The vinyl liner needs to be replaced every 5–9 years, costing $4000–$4500, which includes the labor and materials. 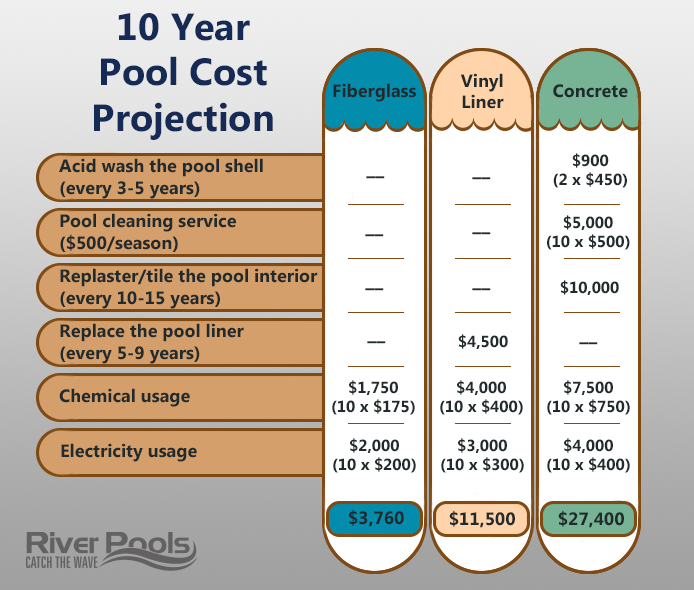 How this adds up: the low initial cost of the pool could be offset within the first ten years after construction, and over the entire lifetime of the pool, it will cost thousands more than a fiberglass pool. The warranty only covers the seams of the liner, where the sections of material are fused together. The warranty does not cover any labor, water, or other expenses. The warranty is prorated—some credit toward a new liner during the first 2-3 years, but very little after that. The interior surface of a fiberglass pool is called the gelcoat. It’s smooth to the touch. Steps or tanning ledges are designed to have an anti-slip texture, but even that’s not rough. The vinyl liner is smooth other than the ridge where one piece meets another. Just be sure to repair any damage and replace the liner on schedule. If the gelcoat is done correctly, you’ll never need to refinish it. The layers of fiberglass in the pool shell provide it with a lot of flex strength. A salt chlorine generator improves your water quality and the salt won’t damage the pool. Vinyl liners for inground pools are usually 20, 27, 28, or 30 mils thick—less than a millimeter. Dog claws or a broken branch can tear that pretty easily. Weird fact: bugs such as ants and termites can actually chew through a vinyl liner. Ew. Hire an exterminator to treat the ground when building a new pool. Verify that your liner warranty covers insects. Try not to think too hard about creepy little bug mouths. You can use a salt water system if your vinyl liner pool has polymer wall panels, but not if you have metal wall panels. 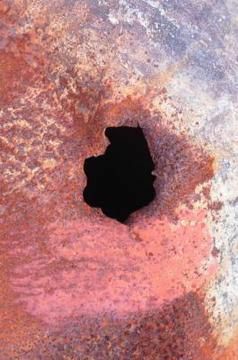 The salt corrodes the panels and any handrail and ladder anchors made of galvanized steel. The liner doesn’t last long overall. You need to replace it every 5–9 years. Even without any major punctures, regular wear-and-tear takes a toll. Underneath that liner, your wall panels lead a dangerous life. Over time, metal wall panels corrode (and even disintegrate), and polymer wall panels become brittle and break. The gelcoat is inert, meaning it doesn’t affect the water pH. You still need to test your water chemistry each week, but you’ll rarely need to add acid to balance the water. You need to replace the liner every 5–9 years. You can do this yourself, but we recommend hiring a professional. It can be difficult to get every edge and corner in perfect position. Wrinkles in your vinyl liner won’t hurt anything, but if you choose to smooth them out, that takes significant time and effort. Divots and dents are usually cosmetic issues as well, but a bump due to a rock or pebble could lead to a tear in the liner. For these issues, you have to drain the pool and remove the liner for repairs. The gelcoat of a fiberglass pool is smooth and algae-resistant. The surface of a vinyl liner pool is also relatively algae-resistant. 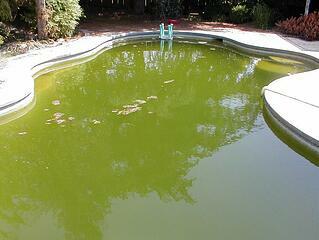 However, algae can grow in submerged areas that don’t circulate water, like the seams around the pool steps. Fiberglass pools use fewer chemicals because, again, little to no algae. Depending on the system, you can also run the pump and filter in shorter cycles or at lower speeds. Hurray for energy savings! Vinyl liner pools also require less time and money to keep the chemistry in balance. Still, be sure to regularly measure and maintain your pool’s alkalinity, pH, calcium hardness, and chlorine levels. A vinyl liner pool’s pump/filter system requires less energy than a concrete pool’s. It’s actually closer to a fiberglass pool’s energy bill. However, you do still have to spend a little extra effort to avoid algae in the poorly-circulated corners. Only you know your priorities for your new pool. We can only provide different aspects to consider as you determine the best fit for you and your family. Maybe the pool needs to fit your specific aesthetic regardless of cost. Or maybe you’d prefer low costs over customization. Unlike vinyl liner pools, fiberglass pools look lovely, can last a long time, and can be customized with cool features. At River Pools we offer both freeform and linear fiberglass pools in Virginia and Maryland (and in other areas of the country through our dealers). If you think a fiberglass pool might be the right choice for you, we want to answer any questions you have! Next: What Type of Inground Pool Is Best for Me? Editor's note: This blog article was updated on February 1, 2019.